I was surprised that they all said that. Remember that Jesus visited non-followers, non believers and he was criticized by the religious folks of his day. They said this man eateth and drinketh with sinners. They said Jesus could not be a prophet of God because he ate and drank with sinners. I thought if I related with anybody, it shouldn't be a problem, even if he was a sinner. There was no reason for that. After all everybody needs the gospel. So from that stand point I was surprised at their response. It was the wrong response anyway. I remember that I made a tape then, called 'Truth on Trial' and there I said, “Just because you hate somebody does not mean I have to hate with you”. When Jesus related with sinners, they did not change him. So, no matter what they thought T.B. Joshua was, my relating with him shouldn't have been expected to change me. So, it was very wrong for anyone to have interfered. during a special service that night. I said we'll be having a service and he said his service was going to be all night long. I was going to finish mine about 9 pm and his was going to be all night, so I said 'alright, how long is it going to take me to get to where you are?' He said it's about 30 minutes, half an hour. I said ok, 'if I get out of here around 9 o' clock, I'll be there by 9.30. I'll try to make it'. I went there with several people. Now you must realize that before I met with T.B. Joshua, I'd been holding crusades and healing services for years. This was 2001 and by then I had held many crusades with thousands of people and we already had our programme, Atmosphere For Miracles, where we showed testimonies of people who were getting healed in our meetings. So healings and miracles were not new to me. When I met with him, of course I was excited, glad to see someone who was interested in the kind of things that I was doing. 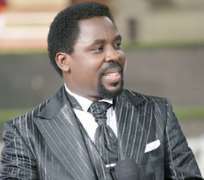 When these controversies came up, when these pastors, Pastor Chris Okotie, Bishop Mike Okonkwo and Pastor Tunde Bakare got on television and began to say a lot of things, I actually had to maintain an association of sympathy with the man. There are so many things I have to say like I told you, but these are all leaders in the church and I wouldn't want to say things that would make them unhappy with themselves or even make members of their congregation unhappy with them. I do not think that is my responsibility. So I would not want to go into certain details. I knew they were wrong all the time. Maybe I should define something, because the issue was not T.B. Joshua. They tried to make him the issue. He was not the issue. And I can prove that. The reason I said they tried to make him the issue is this; the president of the Pentecostal Fellowship of Nigeria, PFN, became the Vice President of the Christian Association of Nigeria, CAN, of which the Synagogue Church headed by T.B. Joshua is a part, Cherubim and Seraphim is a part, Celestial Church of Christ is a part and many other groups. In fact, he became the de facto Vice President of the Synagogue! And nobody said anything about it. There could be no better endorsement of T.B. Joshua from the PFN than that. If you could fraternize with all these groups as their Vice President, doesn't that say something, if indeed any of them was really of the Devil? Imagine Paul the Apostle as the Vice President of an occultic group? The point is T.B. Joshua was not the problem. They used him as the reason for their actions which were based on their wrong spiritual perceptions.